“Jon Brandt’s email signature ends with the simple phrase: “How may I serve you?” It’s a motto that’s been a part of his life since he was a young man, when he embarked on a 20-year career in the Marine Corps. That ethos of serving others continues to permeate his life now, in his full-time job as the owner of a homecare service and while working as a volunteer for several organizations. Most of the time he donates, 20-30 hours a week, is spent driving clients of the Salinas-based nonprofit Independent Transportation Network Monterey County. Flashback, Phil Bowhay: Going my way? One of the better things about not driving anymore — seriously mature, visually impaired, among other things — is the people you meet. Those behind the wheel that pick you up, drive you around and bring you home again, or to hither and yon, your choice. I tell you this as a public service. Sure, there are friends and relatives who are happy to give a ride, but now and then, well, you know the rest. Of course, if you live in the center of Pacific Grove, it’s an easy walk or stroll to Grove Market, Fandango or any number of fine establishments. On the other hand, if you want to visit Ryan Ranch, Monterey, Carmel, the airport or places in between and beyond, better to pay a little, with no strings attached. All of this takes me back to the good old days when we hitchhiked. Lots of stories there, but later. April 12, 2017, Monterey, CA – USA Today Network has launched a grant competition titled, “A Community Thrives” (ACT). National nonprofits have created videos to inform their communities about the amazing work they do, but to also win the opportunity to be considered for a $50,000 or $100,000 grant. ITNMontereyCounty has created a video: http://act.usatoday.com/submit-an-idea/#/gallery/59852992. Voting begins at 11:59am EST on April 12, 2017 and ends at 11:59am EST on May 12, 2017. Vote by visiting the A Community Thrives (ACT) official website during the Voting Period. Maximum one (1) vote per person, per day. All applicants will receive an email informing them if their application will move onto judging or not. Up to 10 applications with the highest votes in each category will be reviewed by a panel of judges after the Voting Period ends. Judges will make their decision based on (1) nature of the community project/need, (2) viability of the community project/need, and (3) evaluation of long-term impact of the proposed community project/need. The panel will determine the top three (3) applications in each category to be granted Awards. The first place application in each category will receive one (1) $100,000 grant. The second and third place applications in each category will receive one (1) $50,000 grant each. Beginning its service in 2012, ITNMontereyCounty (itnmontereycounty.org) is a 501c3 non-profit organization that provides 24 hour/7 days-a-week transportation to help seniors (age 60 and older) and visually-impaired adults (age 18 and older) to remain independent and active in Monterey County. Supported by members and donors, ITN Monterey County provides 24 hour dignified transportation for seniors in private autos, insured and inspected, with arm-through-arm, door-through-door service with affordable fares. ITNMontereyCounty currently over has 345 members who have received over 31,000 rides in 12 local communities within Monterey County. Volunteer drivers drive at their convenience in their own cars and give rides that are typically less than 20 minutes. They meet interesting people while helping others, plus they earn credits for themselves or a loved one, or receive mileage reimbursement. Seniors may also trade in their automobile for credits. The service may be used for any purpose, without restriction, in an ITNMontereyCounty service area. ITNMontereyCounty members often use the service to attend senior college, to get their hair done, to shop at the mall, or to go out on dates. The organization currently needs more volunteer drivers and donors. For more information, go to itnmontereycounty.org or call (831) 233-3447. Tags: ITNMontereyCounty Competitor in USA Today’s "A Community Thrives"
ITNMontereyCounty was honored to be interviewed on Brickman Banter. To reach the ITNMontereyCounty portion of the interview please begin about 30 minutes in. Transportation is a key ingredient to help insure that Monterey County senior citizens maintain their independence. On Aug.5, BMW Manager Paul Giovino hosted the 25,000th ride of ITN Monterey with Executive Director of ITN Aimee Cuda at his dealership in the Seaside Auto Mall. Independent Transportation Network/Monterey County (ITN) strives to meet the Monterey County seniors’ needs and those efforts were celebrated on Aug. 5 at the BMW Seaside location. BMW Manager Paul Giovino provided the space to hold the celebration. In the tradition and the requirement of ITN’s program, Beach was picked up at her door and taken to the door of her destination, Seaside. This unique service is not only about transportation but building friendships and helping to keep independence for seniors and the visually impaired. You can become a member completing an online application or download and mail on to us. Recently, ITNMontereyCounty had a member sign on who needed the service only for a couple of months while he recovered from open heart surgery. HE’S GIVEN 3,500 rides to people over the last four years, but he’s not a cabbie, nor is he an Uber kind of guy. 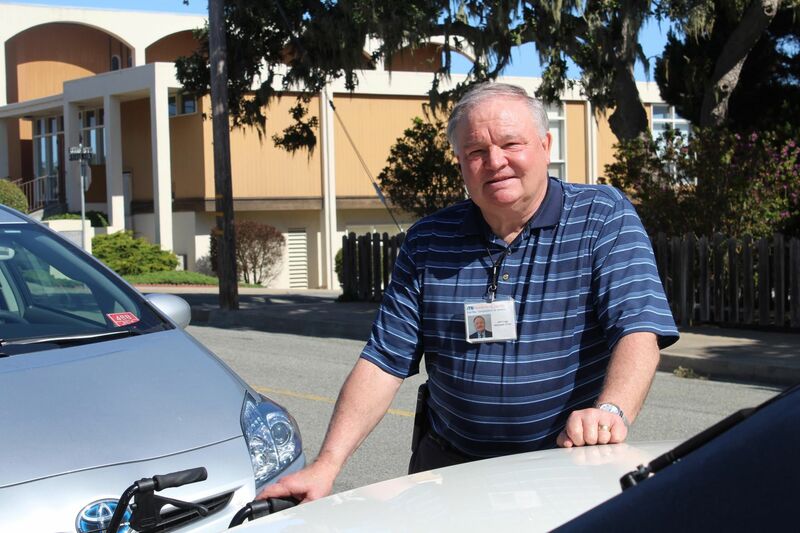 Jeff Craig is a volunteer with ITN Monterey County — the Independent Transportation Network — which helps seniors and those with vision problems with low-cost rides. Craig said volunteer drivers use their own cars and the service, which is operated on a membership basis, is available on-demand or by pre-planned appointment. Seniors frequently use it for medical visits, but they can use it for anything else, like visiting the grocery store or taking classes at MPC. Craig said the second-most-popular destination is the beauty salon. He’s been driving for the nonprofit since 2012 and is currently the chair of its board. There are more than 50 volunteers and 300 member-riders, and Craig said they give an average of 50 rides a day, most of them less than four or five miles. The bulk of the rides occur Monday through Friday. ITN Monterey County provides rides to seniors 24-hours a day, 7-days a week in nearly every community in the county. To date, their volunteers have given over 25,000 safe passages to our elderly citizens who have age-related issues that don’t allow them to drive safely. Congressman Sam Farr and other local elected officials come to BMW of Monterey to join ITN, some party-minded seniors and snacks from Eddison & Melrose Tea Room to mark the milestone. ITN receives zero public funding and depends on donations and good people to keep this vital service running. The Independent Transportation Network Monterey County has been awarded a $10,000 matching grant from the Harden Foundation. All donations will be matched dollar for dollar up to $10,000. The purpose of the grant is to continue providing rides for seniors and visually impaired adults. Community members that would like to contribute to this worthy cause can donate at itnmontereycounty.org or by mailing donations to ITN Monterey County, 5 Harris Court, Building A, Monterey, CA 93940. Aimee Cuda is the director ITN Monterey County. “Our clients get rides to every kind of errand, from doctor visits to social events.” One client even gets a ride to and from her job every day. “The ITN ride service is available 24 hours a day, every day of the year,” Cuda said, A ride must be arranged before 2 p.m. on the day before it is needed. ITN provides arm-through-arm service, not just door to door. “Our drivers make sure the clients gets to their destinations with dignity and safety,” said Cuda.